Recognized by its tall, beautiful steeple, the evangelical congregational church was built in 1809 on the former site of the old town granary. 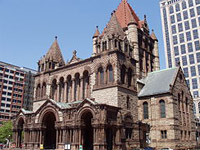 Its large and active congregation has a long and strong tradition of social service going back to a well known 1829 speech against slavery delivered by William Lloyd Garrison. 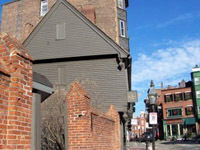 Paul Revere’s wooden house, going back to 1680, is the oldest residence that remains in downtown Boston. Revere lived in this home in the early 1770s where he was a silversmith and patriot. The home later served the Italian immigrant community for commercial purposes. Saved from being demolished in 1902, it has been restored to its original appearance. 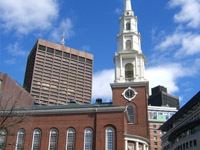 The Prudential Center is Boston’s first unified business, residential and civic complex with 28 acres of hotels, restaurants, shops, and plazas, in addition to parking and covered walkways. 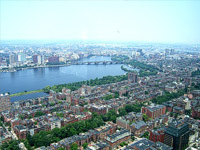 On a clear day, the view is endless from the 50th floor observatory atop the Prudential Tower. The Skywalk offers a state-of-the-art antennae audio tour and special exhibits on Boston history and architecture. 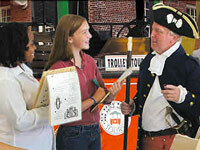 On the Old Town Trolley Educational Tour for middle-school students, kids will enjoy Boston’s best 2.5 hour historical field trip. Open since 1900 and famous for its acoustical perfection, it has been host to a wide range of important performances and is the home of the Boston Symphony Orchestra and Boston Pops. 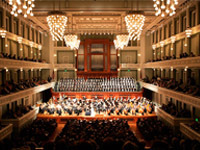 Free tours are offered during Symphony season on a limited basis. 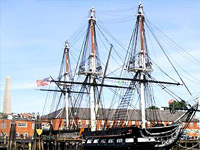 Better known as Old Ironsides, the USS Constitution launched in 1797 and is the world’s oldest floating commissioned ship. Climb aboard the decks in proud service until 1934 as a warship, blockade runner, training ship and goodwill ambassador. American H. H. Richardson is the proud architect of this massive masterpiece. The impressive church has an exterior of dark multi-hewed stone, majestic stained glass windows and a breathtaking interior. 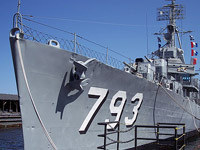 The USS Cassin Young is a WWII destroyer and is a designated National Historic Landmark.